Habit: Guapira discolor grows as a small to medium size tree up to seven meters in height. The leaves are arranged oppositely, up to 12 centimeters in length (usually smaller) and are oblong with a retuse leaf apex. The leaves can be variable in shape within the same plant. The leaves may be somewhat fleshy in texture and the mid rib is translucent. Specimens often have a hanging or dropping appearance to the branches. The flowers are arranged in reduced panicles. The flowers are staminate or carpellate and occur on the same plant (monecious). The calyx and corolla have five sepals and five petals that are fused together to form a perianth. Staminate flowers are larger, yellowish-green and have seven functional stamens. Carpellate flowers are small, darker green with seven non-functional stamens and a single seeded ovary. The fruit is a drupe that turns bright red at maturity and becomes ribbed (10 ridges) as it dries out. Habitat: Guapira discolor is found commonly on both sand and limestone rock substrates in Dry Broadleaf Evergreen Formations (Coppice) as well as in Pine Woodlands. Distribution in Bahamas/Globally: Guapira discolor occurs on all island groups within he Bahamian Archipelago as well as south Florida and the entire Caribbean region. Medicinal/Cultural/Economic usage: Guapira discolor has no know medicinal uses. The fruit has been reported to be edible. 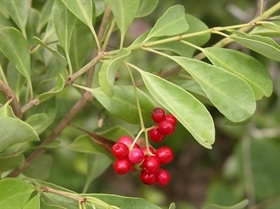 G. discolor is protected by the government of the Bahamas.